We are straight back into the action with Game 2 in the Euroleague Playoffs and these two teams clash again on Thursday night, which is a very quick turnaround from their clash on Tuesday evening. The reigning Euroleague champions showed that they are in no mood to let their title slip from their grasp this season and the Russians know that a victory in this game will place them in a very good position for the series. Of course, it wasn’t as straightforward as you may think. While the Russians ran out victors by 8 points at the end of the game the fact that the Spaniards held a slim lead with two minutes on the clock is a very big story. Obviously, it is only the final score that matters but both of these teams will know how differently this match could have panned out, so we could be in line for another thrilling match in Moscow. The Moscow side ended the game with a 10-0 scoring run to turn the match back in their favour and Milos Teodosic was a key player on the night. Teodosic managed to grab 22 points and 5 assists on the evening but it was a night when many players stepped up for CSKA Moscow. By the third quarter, there were eight separate players who had bagged at least six points for the home team. This is the sort of display that has seen the Russians sweep many times aside in the past couple of years. Nando De Colo offered up 17 points in what was a relatively quiet night for the star player but he still made enough of an impact on the match to help his side to victory. There were a few players that got on the score sheet for the Spaniards too, with five different players in double figures. It looked as though it was going to be a great night for Shane Larkin, offering up 17 points in the final 11 minutes of the game. There was also a big effort from Johannes Voigtmann who provided 12 points and 8 rebounds in the game. 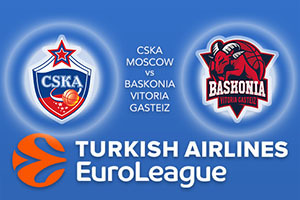 For Thursday night, take Baskonia Vitoria Gasteiz at +11, at odds of 1.90. If you’re looking for the Over/Under market, go OVER 170.5 at odds of 1.90. Bet Now!